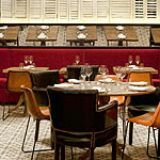 Iberica Canary Wharf is a modern venue that offers a similar menu to the Fitzrovia branch. 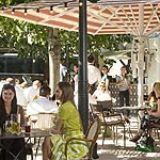 "Ibérica Canary Wharf brings a flavour of Spain with our signature style of traditional Spanish cuisine served with a contemporary twist. The selection of hot and cold tapas has also been created by our Executive Chef Nacho Manzano, awarded two Michelin Stars for his flagship restaurant in Arriondas, Casa Marcial and 1 for La Salgar, in Gijón. Lázaro Rosa Violán, of renowned Barcelona based Comtemporain Studios, has created a modern design with traditional elements of Spanish culture woven throughout the space. The open kitchen has been intelligently incorporated into the design to allow diners to see the chefs in action and experience the energy of a busy service. 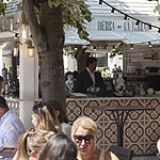 The bar has a selection of classic and signature cocktails and the Ibérica Delicatessen offers the famous Jamón Ibérico hand-carved to go." Real Academia de Gastronomia: Marques de Busianos 2011. What did you think of Iberica Canary Wharf? In contrast to the modern, corporate streets of Canary Wharf, Iberica feels surprisingly warm and well-established. It’s hard to fault the infectious enthusiasm and talent of head chef Cesar Garcia, or the modern take on traditional Spanish dishes. 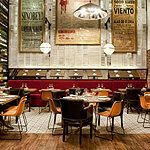 Sister venue to Iberica Marylebone, which has received some criticism for being a bit staid, Iberica Canary Wharf gets it spot on. 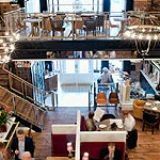 It’s a large space, with separate mezzanine levels rising either side of the central dining area, done out in a casual but luxurious style. The bare, strong wooden floors and tables, surrounded by an assortment of banquettes and chairs (including some devilishly comfy leather armchairs), are accentuated by soft lighting, painted brick walls and huge vintage posters. If you can, opt for a seat up against the wire balcony so you can get a bird’s eye view of the tables below. It’s smart, yes, but it’s also relaxed and you’ll feel perfectly at home whether you’re meeting clients or catching up with friends. That said, Canary Wharf – an area better known for mid-range chain restaurants – feels a slightly incongruous location to open this second branch. Start with the platter of mixed Iberico ham (£22.20), which is worth the price not just for the individual merit of each one – served in thinly carved slices on a black slate – but for the comparison between their varying sweet, nutty flavours. If you’re after something light, you could wash this down with a glass of fino, some crusty bread and olive oil and leave happy, but Iberica’s strength is the extensive menu of ‘gastronomic tapas’ that follows. Before moving on to the richer choices, the gazpacho of red berries, beetroot and anchovy (£4.90), served in individual bowls, is perfect for cleansing the palate. Refreshing yet complex, it comes with a pop of intense flavour from the anchovy and a hint of mint. From the more conventional options, the croquettes (starting at £5.65) are good, as you’d expect, but the less-traditional dishes are excellent. The delicately presented scallops with tiny, tart cubes of apple and rich cauliflower purée practically melt away as you eat them: an absolute triumph and a justified £10.75. If you’re after something un-fussy, dig into the spring onion tempura, served-up with cute mini jam-jars of lemon aioli and soy for dipping (£4.90). Another highlight is the duo of mini Iberica burgers (£7.90), a combination of mouth-wateringly succulent pork offset by a zingy piparras pepper. Save room for dessert, too, especially the exquisitely creamy rice pudding (£3.80); you’ll smell the waft of caramel before it reaches you. There’s a vast, well thought out selection of regional wines on offer, starting at £23.90 a bottle. Try the Torres D’Anguix Barrica, a light tempranillo with aromas of red fruit and a smooth finish. There’s also a good range of sherries and cava, but you’ll have to search out something soft. Iberica offers the quality you'd expect but with a lot more fun and none of the faff. 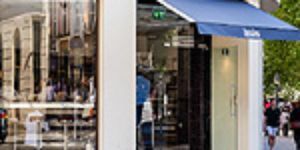 There are so many dishes that it’s only possible to dip a toe in the water on a first visit, so if you’re not lucky enough to work in the shadow of Canada Square, you’ll definitely want to make the schlep back to E14. 15 destinations curated by View .